With the increasing coverage of the America's Cup, it might prove of interest to look back on the Bay of Quinte Yacht Club's entry in the America's Cup Race of 1881. The members of BQYC issued their challenge to the New York Yacht Club in a letter dated May 16, 1881. Their challenge was accepted on June 12, 1881 with the New York Club waiving the required six months notice and the race date was set for September. The Atalanta, named for a mythological maiden known for her racing ability, was built in the Flint and Holton Lumber Yard on the west side of the Moira River in Belleville. The building of the yacht was wrought with many difficulties and she was mortgaged for the lumber from Flint and Holton for a total cost of $2,100. There were many delays in construction but she was finally launched in the late summer of 1881 - only half equipped and poorly finished because of the shortage of funds. The Atalanta was 78 feet long with a beam of 19 feet 6 inches and a draft of 6 feet 5 inches with the centreboard up and 16 feet 6 inches with the board down. She should have been a beautiful sight on her maiden voyage but eyewitness accounts state that the hull was rough-hewn and the crew were still nailing planks to her deck and completing other carpentry work as she sailed down the Bay of Quinte. With the completion date being so late in the season The Atalanta did not have time to sail the St. Lawrence-Ocean route to New York. She was forced to take the short route and she entered the Erie Canal at Oswego. Because her beam was 16 inches wider than the canal, the crew had to shift her ballast of iron ore and Bay of Quinte boulders to one side in order to heel the boat enough to permit her passage through the narrow locks. She was then towed through the canal by teams of mules. The canal hands nicknamed her "The Canadian Mud Turtle" after seeing her rough, muddy bottom as she passed through the locks. When the Atalanta reached Albany, New York and the end of the Erie Canal, her crew once again shifted her ballast to put her back on an even keel. They restepped her mast and set sail for New York. The Atalanta finally sailed into New York Harbour on October 30, 1881. With her arrival in New York Harbour on October 30, 1881, preparations for the challenge races for the America's Cup began. 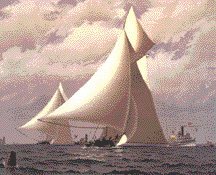 The New York Yacht Club, while not overjoyed with beginning the series so late in the season, set the date for the first race for November 8, 1881. The American defender, Mischief, was the second yacht built in the United States and the first one to defend the America's Cup. She was designed by A.Cary Smith of New York and built of iron in Wilmington, Delaware in 1879. Her dimensions were 67 feet 5 inches overall; 61 feet at the water line and 19 feet 10 inches at the beam. Her 5 foot 6 inch draft with the centreboard gave her a total draft of 16 feet. Her mast was 63 feet 6 inches with a top mast of 41 feet 6 inches. Her boom was 62 feet 6 inches and the spinnaker boom was 43 feet 8 inches. Before entering the races with Atalanta, the Mischief was hauled out and her underbody was sanded, holystoned, varnished and potleaded until it shone like platinum. This was in very sharp contrast to the rough hewn hull of the Atalanta. The Canadian challenger seemed plagued with problems in the days prior to the first race. Many of the crew promised from Belleville didn't arrive and the small group from Belleville was complimented by a number of amateur sailors from the Oswego Yacht Club. Atalanta was not really in shape for racing. She was over-sparred with poorly cut sails. Prior to the first race her main mast was cut down and her head sails altered but time was limited and many necessary alterations were left undone. The November 8 race was canceled because of poor weather conditions. The first race began at 11:00 a.m. on November 9, 1881. The winds were very gusty and proved too much for the heavily sparred Atalanta and many observers feared the vessel would capsize in the heavy seas. Atalanta lost 40 minutes in reefing and as a result lost this first race to Mischief by 28 minutes and 20¼ seconds. The second race was held the following day in a strong north west wind. The course was over 30 miles long and the Atalanta crossed the start line only 30 seconds behind the Mischief. Atalanta seemed to be holding her own until the spinnaker boom snapped causing a loss of speed and time. When both yachts rounded the first mark, the Atalanta was only 2 minutes and 15 seconds behind the Mischief but the final leg of the race found the challenger beating into gale force winds. She finally struggled across the finish line after sunset, 38 minutes and 54 seconds behind Mischief, the winner of the America's Cup for 1881. In spite of her poor sails, rough finish and poor handling, the Atalanta impressed many Americans with her speed "under such handicaps" but after what the Americans termed a "fiasco challenge", the deed of gift was changed. All challengers should come under sail thereafter (a rule not often used today)! Photo of America's Cup taken at 2001 challenge that Peter and Jill Cox attended. Captain Alexander Cuthbert was also the designer and builder of the Countess of Dufferin, from R.C.Y.C., the first Canadian challenger to the America's Cup in 1876 and now with the Atalanta, he was the only man to have entered a challenge in the America's Cup on a vessel which he himself had designed, built and skippered. It was a sad time for Cuthbert when he tried to challenge for the next race and was refused because of a deed of gift ruling. The Atalanta returned to Lake Ontario the next year. She underwent many changes and modifications and continued to sail on the Great Lakes with much success. In 1883 she sailed to Chicago to enter the race for the Fisher Cup. In the first race she was leading but broke her spinnaker boom and lost the race to the Cora of Chicago. After completing the necessary repairs, Captain Cuthbert promptly challenged the Cora to a match race the following week. The Atalanta beat the Cora by 16 minutes over the same course and returned to the Bay of Quinte with the Fisher Cup (the championship cup for yachts on fresh water). She held this trophy from 1883 until 1886 when she was defeated by the Norah which was also built by Captain Cuthbert and owned by John Bell, Q.C. of Belleville. The Atalanta was partly burned in 1896 and was subsequently sold and taken to Chicago where she was rebuilt with higher sides and flush decks. She was last heard from in New Orleans around the turn of the century. 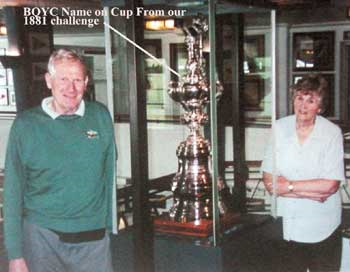 BQYC carried on with it's America's Cup history by competing in the now famous America's Cup Jubilee Regatta in Cowes, England, in August of 2001. The BQYC crew did a great job were very pleased with their in the top third standing in the "Modern Class" competitions... upholding, in their own way, BQYC's America's Cup tradition.